Now that a vendor has been selected and the scope (ISBL) of that vendor’s supply is known, the balance of the system can be assembled. The first step in designing the system is to understand what ancillary components or devices are required. Purchasing one piece of equipment is likely just the first step in building out a complete operating system – there’s a lot more to it. The best tool to guide this process is Process and Instrumentation Diagram (P&ID), sometimes referred to as a Piping and Instrumentation Diagram. The P&ID is where the connection of the main piece of equipment to the facility begins. This is where the need for pumps, instruments, utilities, piping, etc. become obvious, and where these decisions are documented. Let’s assume that the procurement process detailed above resulted in the purchase of the cooling tower TW-9220 in the sample P&ID. The typical scope of supply (ISBL) for such a tower would include only the tower TW-9220, the basin heater HE-9222, and the motor that is shown as 22 KW. For each of the items not in the tower supplier’s scope, many decisions must be made, and likely, a procurement process similar to the process outlined previously must be followed. To support that process, each component must be engineered and specified prior to approaching vendors for these items. Electrical System Specification & Design: motor starters, cabling, arc-flash study, etc. Pipe Line Sizing: flow rates, pressure drop, etc. Pipe Routing: support design, tie-in location, low point drains, high point vents, etc. Process Water Supply Evaluation: available water capacity, water quality, etc. Blow Down System Capacity: process waste, sanitary sewer, etc. The main point of this exercise is to further illustrate the fact that purchasing a piece of equipment, in this case a cooling tower, is just the beginning of developing an operating cooling tower system. What Constitutes a Complete System? In the previous cooling tower example, many of the decisions, engineering functions, and procurement functions were addressed. There are many more considerations that must be evaluated before a safe, reliable, and efficient system can be expected. It’s crucial to take the time to ensure these precautionary measures are met, in order for your system to be as successful as possible—as well as ensuring your environment remains safe. 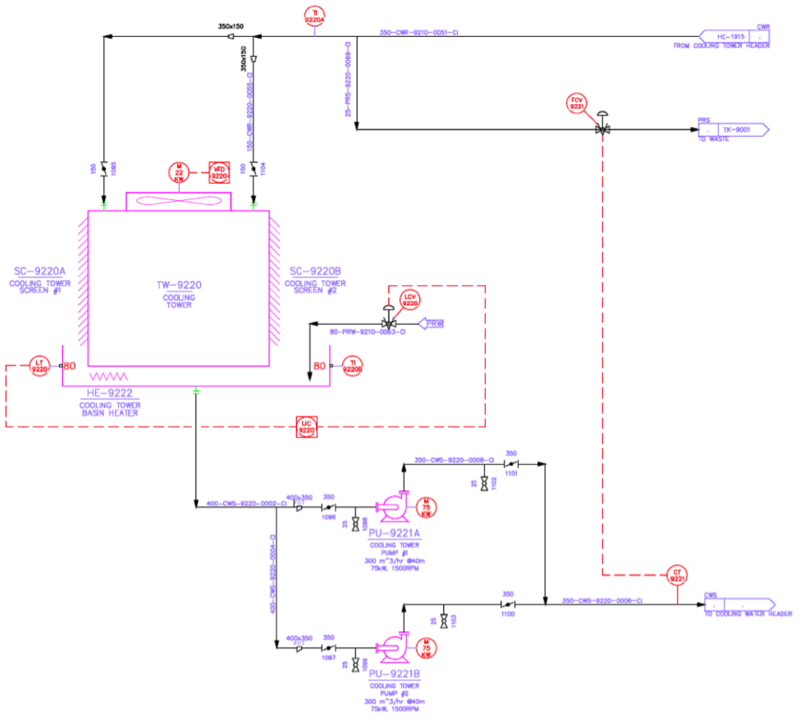 How are required ancillary components identified? What utilities are required for all the components of the system to function properly? How will physical support and access for the major and minor equipment be determined? What is required to make the system operate as expected?